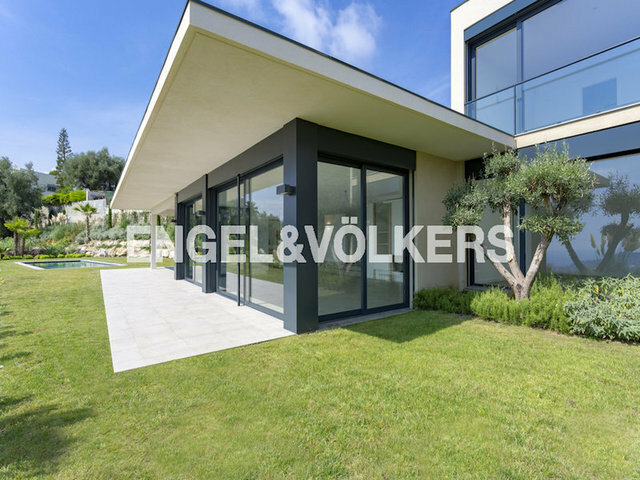 Nice, next to the Airport Nice Côte d'Azur, in a green surroundings of 2500 sqm with swimming pool, new spacious modern villa of 270 sqm with sea views overlooking the city and Baie des Anges. Beautiful and spacious dining room, including an equipped central island, and bright living room with fireplace and high ceilings. On the level of the garden, there is a private apartment equipped bathroom and dressing, and separated access. On the first floor there are three panoramic sea view bedrooms with bathroom and dressing each. Double garage and a laundry room, a 2500 spm garden with Mediterranean species and beautiful swimming pool complete this fantastic property. Situated next to the international Nice airport and Monaco.